Small business owners sometimes turn to credit cards for financing their operations. Since banks effectively closed their doors to small businesses after the Great Recession of 2008, small businesses have had little choice if they wanted to keep their doors open. A survey conducted in late April 2009 found that 59% of small businesses had to use credit cards to finance their operations. Even business start-ups are using credit card financing to get their businesses off the ground. Usually, owners of start-up businesses don’t yet have business credit. They only have their own personal credit. As a result, they only have personal credit cards. If they use personal credit cards for financing their startup businesses, then they are personally liable for any debt they incur. 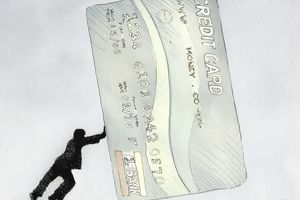 What if you, as an owner of a promising start-up business, run up a lot of debt on your personal credit card trying to get your business off the ground and it fails? Then you have incurred massive amounts of debt with nothing to show for it. Using a personal credit card for financing a start-up business means taking on a significant amount of risk. Yet you don’t have business credit yet, so you can’t qualify for a business credit card which gives you some protection. If you can’t get a bank loan, which is unlikely for a start-up, and you can’t get investor funding, what other choice do you have? It’s best to use your own personal savings or funding from family or friends if you can. If those sources aren’t available and you think you have a really hot idea for a start-up business, then you may have no choice but to turn to personal credit card financing. If you have to use credit card financing to startup your new business, what factors should you consider? Before you start your business and start using your personal credit card for financing expenses, get your house in order. Pull your credit report. Your credit should be spotless or nearly so. Be sure you are up-to-date on all your obligations. The most important thing is that you should be able to afford the credit card bills that you will incur from the business use of your card. You have to have some idea of how much debt you may have to put on your cards and if you can afford at least the minimum payments. If you can’t, stop right there! If you have a great credit rating, try to negotiate lower interest rates with your credit card companies. Work with at least three companies. You may need a large cash advance to get your business off the ground. Try to get your interest rate on cash advances down as low as possible. If you’ve always paid your bills on time and your credit score is good, you may be able to do this. You want to do this with at least three credit cards so you can juggle them to lower or eliminate interest charges as you start up your business. Putting large amounts of money on credit cards will impact the rest of your life. Don’t do it if you also need to buy a house or a car or need to borrow money to send your child to college. The rest of your financial life should be stable because putting a large amount of money on credit cards will likely lower your credit score even if every payment is made on time. This is because you will be using up your debt capacity and card companies utilize this fact in calculating your credit score. As you start financing your business with personal credit cards, credit card companies may start to raise your interest rates. There is nothing much you can do about this except make sure you make every payment on time. Try to find card companies that offer fixed interest rates as this gives you some protection. If you make a late payment to one card, another card may actually raise your interest rate so don’t take this chance. Another safeguard is to try to make more than the minimum payment each month. Do not go over your credit limit as this also raises red flags and will cost you money. Just like with rising interest rates, as you use more credit card financing, you become vulnerable to the possibility of the credit card companies’ reducing your credit limits. The only thing to do about that is to quickly draw down as much as possible in cash advances making it impossible for the credit card companies to do that. Then, in order to prevent your credit score from dropping, be very diligent about sticking to your credit limit and making your payments on time. Using personal credit card financing certainly isn’t the best way to finance your new start-up business. However, there are techniques you can use to make it work if you are careful. As soon as possible, you should replace this type of financing with the bank or some other financial institution financing or outside investor funds.